Chicken and ham pie is one of those dinners that never seem to go out of fashion. Whether it’s something your mum or your grandmother made, it remains as popular today as ever. Containing lots of goodness, children also seem totally unconcerned about the vegetables and meat hidden under the pastry topping. Isn’t it Difficult to Make? The reason most people may not try making a chicken and ham pie, is that it seems to them a tricky recipe to make – but nothing could be further from the truth, because with the right ingredients, this can be a really easy dinner recipe. 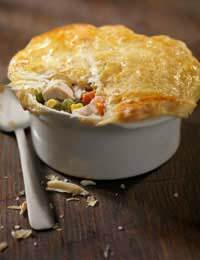 The easiest way to make a chicken and ham pie is to use some pre-cooked pieces of chicken breast, some pre-cooked slices of thick ham, diced, a jar of ready-made béchamel or cheese sauce and some bought pre-rolled puff pastry. Place the chicken and ham in an oven-proof dish, pour the whole jar of sauce on top and then lay the pastry on top of the dish. Cook in a pre-heated hot oven at about 200°C / 400°F(Gas Mark 6) for about half an hour, or until the pastry is golden and the dish bubbling. If you have more time, or are a slightly more ambitious cook, why not make a chicken and ham pie from scratch. It’s a great way to used left-over chicken pieces from roast chicken or baked ham. Otherwise to feed 4-6, take 4 275g chicken portions and boil in a large saucepan together with a celery stick, 2 large onions, 2 carrots, cut in half lengthways and seasoning for 5 minutes. Then simmer for about an hour. Check from time to time that the water is not running low, and if it is, then place a lid three quarters the way over the top of the saucepan. At the end of this time, remove any scum floating on the surface of the water and then drain the chicken, reserving the vegetables and chicken stock for later. Gently fry an onion in butter and when soft, add a crushed clove of garlic, the carrots you saved earlier and if to taste, some chopped mushrooms. When soft and golden, sprinkle in a tablespoon, or about 40g, of plain flour. Then whilst still stirring, gradually re-introduce about 200ml of the chicken stock and continue to stir over a gentle heat until the sauce has thickened. If you like a creamy sauce, you can add milk or cream at this point. Now add the cooked chicken to the sauce and also 100g of diced cooked ham. You are now ready to pour the chicken and ham mixture into an oven-proof dish. To assemble the pie, dampen the rim of your pie dish with a little water or milk and then cut a strip of pastry to stick around the edge and dampen again. You can use either puff pastry or short crust pastry as you wish – both work very well. Then rolling out the remaining pastry, place the ‘lid’ over the pastry edges. Then ‘crimp’ the edges gently with your thumb and forefinger or press all around with your fingers to seal. Finally, brush the pastry top with either an egg-wash or a little milk so that it turns a wonderful golden brown in the oven. Then bake for half an hour at 220°C/425F or Gas Mark 7.